The SanDisk Ultra micro SDXC UHS-I Memory Cards are know for sheer speed and performance which let you get more out of your photography and Full HD (1080p) videos and more. The cards’ Class 10 speed rating makes them ideal for shooting Full HD (1080p) video and high resolution photos, while outstanding transfer speeds (up to 30MB/sec). The adapter included ensures compatibility with SDXC card slots, letting you quickly transfer files to your PC. Designed to keep on working even in testing conditions, SanDisk Ultra micro SDXC UHS-I Memory Cards are waterproof, temperature-proof, shock-proof, vibration-proof and x-ray-proof. Ultra Performance - High-speed data transfer rates of up to 30MB/s allow fast and continuous capture of high quality images. Ultra HD - Class 10 and UHS Speed Class 1 (U1) video rating ideal for capturing cinema quality Full HD (1080p) or 3D Video. 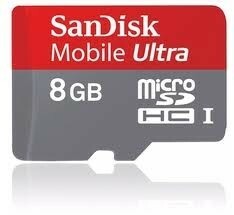 Ultra Storage - 8GB capacity allows plenty of room for photo, videos and other files, large or small. Ultra Versatile - Included SD adapter for extended compatibility with SDHC enabled cameras, camcorders, laptops , tablets and more. Ultra Durable - Waterproof, X-Ray proof, temperature proof and shockproof to protect your data even in the worst of conditions. overpriced bag of screws. customer service is very bad. Took 4 days to answer an email. I send at least 4 emails. Took them 4 days to mark item from processing to shipped.